Yo John! You hanging out with the Jesuits again? Inept hubris causes panic, which breaks the Cannabis fantasy. You'd have to be smokin' some pretty funky cannabis to make heads or tails out of this one... but here goes! "Don't panic, America - the hubris-induced delusional fantasy currently keeping this inept administration alive should be over by 2012, so long as you remember to take the red pill (not the blue one) at the voting booth." This here's a harshin' my meller. I figured the answer to the "big jumble" would HAVE to be either lysergic acid diethylamide or 5-methoxy-dimethyltryptamine, but when there weren't enough blanks, a lot of the letters didn't occur enough, some of the letters didn't occur at all, and there were no numbers, I just figured this was a defective puzzle and I gave up. "T" said he thought the answer might be "an IQ two standard deviations or more below the mean", but that didn't fit either, and given how many people there are who STILL think Obama is doing a "good job," this would violate the population density of the normal distribution, indicating that the distribution for IQ is a significantly skewed right lognormal distribution. I have no idea what the second paragraph means, but "T" says it's hilarious. 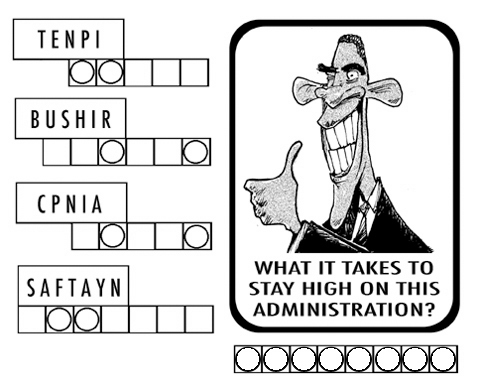 The hubris, inept panic stricken President on a cannabis high living in a fantasy world. Like I needed another distraction today! I'll get this MF even if it takes 6 weeks. Busy with work for the moment though. In a panic, Bill realized that perhaps his vision of an inept president consumed by hubris was no mere cannabis-induced fantasy. OK everybody had it right! I like T's Background Comment. I'm sure that's you T! Now ya'll know why I accused John of hanging out with the Jesuits. They like to screw with peoples minds too. In a cannabis induced fantasy, we are not panic stricken when faced with B.O. 's inept hubris. Therefore, let us all light one up in the name of sanity! Looks like you guys had some fun with this. I though the sentence constructions were much shaper than I may have anticipated. Well done. Hey John, what did you expect? We're like carp. When you give us the right bait we'll grab the hook every time. I sent this to a number of friends. Sorry to disappoint, but "One to stay in the background" isn't me. However, most of Rutager's post is my idea. He didn't do a very good job on paragraph 2, though. I will say this: Scott Brown (B.A. in history, J.D. in law), Olympia Snowe (B.A. in political science), & Susan Collins (B.A. in government)--NO EDUCATION in economics or finance--just f___ed industry in a major way. Lawyers & career politicians regulating derivatives? I'd be willing to bet that you could fit everything that every member of the House & the Senate knows about derivatives--combined--on a cocktail napkin--with enough room left over for John's Anagripe on one side & 3 Quiptoons on the other. But why am I surprised? They don't know anything about health care or macroeconomics & "stimulus" policy either, but they "regulated" (i.e., legislated) those like they had a direct line to Staples "Easy Button" & there was a fire sale on red ink. Sorry, John. THAT'S my last "downer" screed. I know you mean well. I'd like this space to be as sharp, yet as FUN, as possible. Gentlemen, Smoke it if you've got it - with this administration and help from the RINOs the only way the taxpayer can feel good is some whacky weed. Sorry Tom Wms, I was sort of stumbling into your post. As for "rubish", the One is a bit of a rube, so it sort of fits. Funny stuff, First time I ahave seen your blog. Keep up the good work. No problem. It's your page. I'm a guest. I'll "moderate" myself. This page contains a single entry from the blog posted on July 14, 2010 11:51 PM. The previous post in this blog was George Steinbrenner (1930-2010).